We've now been told that the dog walk was the suggestion of the autistic son of a Green-Wood higher-up when asked how he'd raise money for autism research. It doesn't matter. That dog walk could just as easily take place on the sidewalk around the cemetery instead of inside. Green-Wood's administrators acknowledge that bringing dogs into the cemetery is inappropriate. Could just anyone do so for charitable purposes? Surely not. So this is happening because the administrator's doing it. In short, he abused his authority. He should be fired. 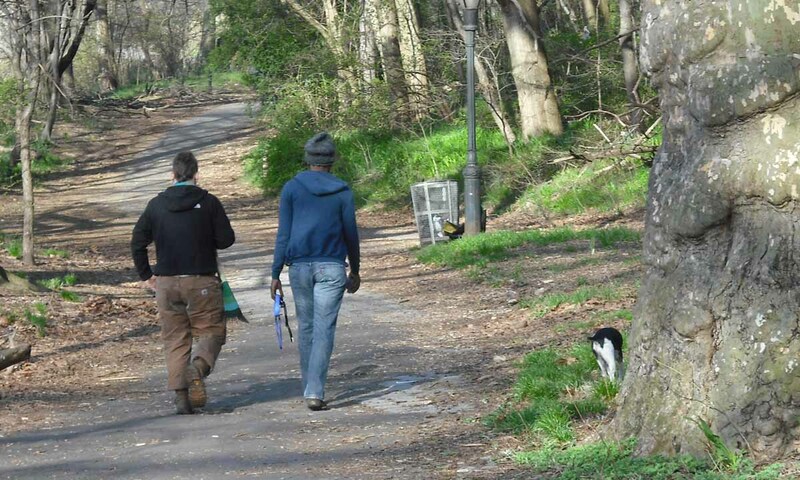 Dogs peacefully walking with owners through Green-Wood Cemetery for a Worthy Cause on a bright spring day. Cops come in gates and confront man and show badge. Man shows gun. Somebody's gun "goes off". Suspect goes down. Dogs start barking; cops start shooting. One dog escapes leash and runs over to police car where he places paws on door and barks threateningly. Cops shoot dog. Angry dog owner pepper-sprays cop (who is meanwhile trying to remember how to reload his gun). Cop's partner shoots dog owner. And we haven't even gotten to the autistic children who are supposed to be along for the fracas. . . . . . And yes, and the forensic examiners never are able to find powder burns on his face to determine how close the suspect was when he was shot (i.e., did he shoot himself or did he "fall down the stairs") because when he went down, a nervous dog promptly peed on his face and the pee washed everything else off. “The park was horrible, you used to risk your life going into the park,” said Tony Chiappelloni, the president of the dog advocacy group, FIDO. “The only people that went in were dog walkers and crack addicts. She saw that once people went in with the dogs, others would follow." As we've documented repeatedly in this blog, the statement is false. In the 1980s the park wasn't great, but it wasn't just dog walkers and addicts who used it--this writer, who did used the park then, falls into neither category, and there were many like him. Contrary to Tupper and Tony, it wasn't the dog owners who saved the park. 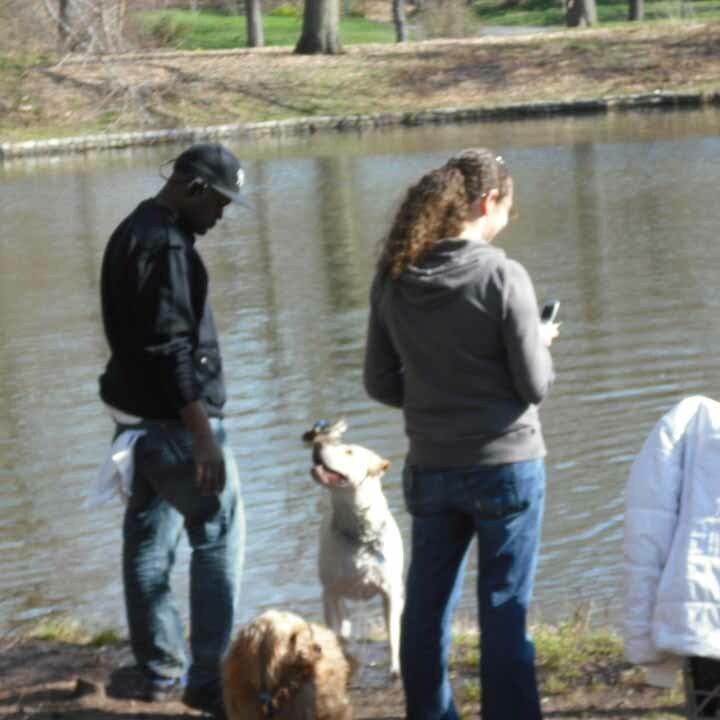 And how does declining to enforce the leash law in selected sections of the park at limited times during the day account for the drop in crime --and increased park usage by non-criminal types-- throughout the park and at all times of day? And is Tupper also taking credit, or giving dog owners credit, for the vast drop in crime throughout the city over the last 20 years? But as usual, while repeating a lie often enough doesn't make it true, it may cause the gullible to believe it. This is entering the Lullwater from the skating rink. The woman on the right told me to show her a badge or shut up. I photographed several others but the pictures are too blurry. One was what probably was one of Marcia's dogs running through the woods south of Nellie's Lawn. I'm sorry you've had to deal with these people for so long and hope that in the end we can curb these thoughtless dog owners and their running dogs.